Space fans love to dress like astronauts, but oftentimes the costumes seen in the stores around Hallowe'en time aren't exactly like what spacefarers wear. Or, they're made for one-time use or don't really reflect the actual spacesuits that astronauts wear. To be fair, the suits worn by spacefarers are made for a very different purpose than most people who just want a costume. 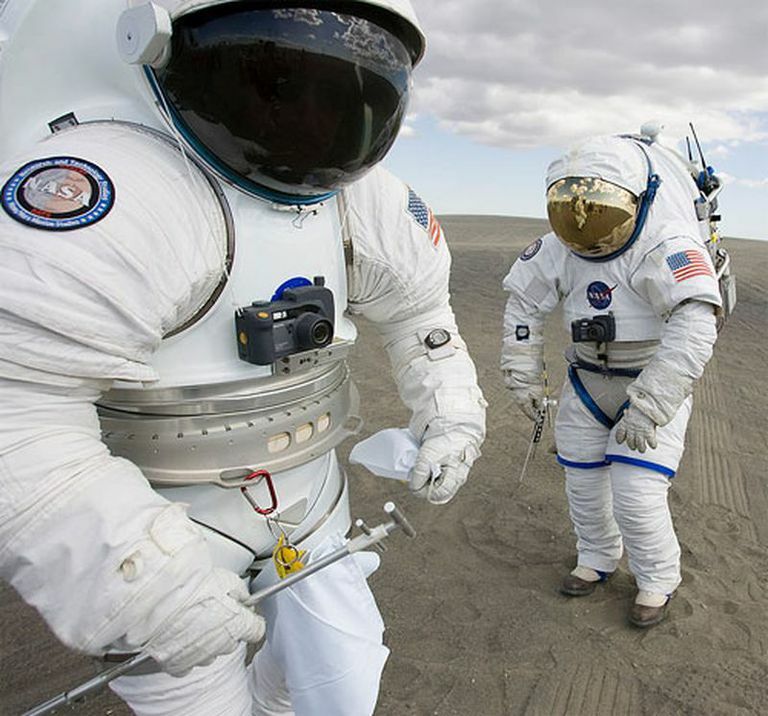 Actual spacesuits are made to protect the astronaut from the extremes of space: cold, heat, radiation, and sunlight. They supply breathable atmosphere for the wearer, and in all cases provides a margin of safety. The famous jumpsuits are specially made for astronauts, with the distinctive design and emblems that mark the wearer as a spacefarer. Not an Astronaut? Get or Make a Costume! There are people who spend a lot of time and effort to get astronaut costumes just right, particularly those who go to space festivals and media cons and other such events. Getting an original, official spacesuit is out of the question for most people. That's because astronaut suits are fitted to their wearers and are incredibly expensive to make. Some do show up occasionally on eBay and other online auction sites but are out of reach of the casual costume-maker. So, where can "regular folks" get an astronaut costume for parties and cons? If it's for a one-time event such as a Hallowe'en party or other costume affairs, then inexpensive replicas CAN be found on Amazon.com or stores in the U.S. such as Target. They're not always exact copies of what real astronauts wear, but they are close enough for a party. Another alternative is to find a place that sells official flight suits, jackets, and other replicas, or making a spacesuit from scratch. There are plenty of online sources available under the search term "space suit replicas." Most space fans are familiar with the blue or orange jumpsuits that astronauts wear on official duties. It's a one-piece concoction pretty similar to flight suits worn by test pilots and fliers for the U.S. Air Force. It has a number of pockets, zippers, and is made with material that will keep the astronaut warm while flying to assignments and living in space on the space station or other vehicles. Most jumpsuits have areas for name badges, mission patches, and other insignia (such as the astronaut's rank or job title). Mission spacesuits, such as those worn on the Moon or on space walks, are made of much tougher materials (such as Nomex or Kevlar). Visitors to some of NASA's centers can often find replicas of the standard NASA astronaut jumpsuit for sale in the visitor center gift shops. They are made by several companies, including Alpha Industries. Their cost ranges around $100.00 to $150.00, and most gift shops have patches that people can buy to "trick out" their jumpsuits. While it's fairly easy to find inexpensive replicas of NASA jumpsuits at places such as Target or Amazon, people looking for actual space suits pay a pretty steep price for those replicas. Just a quick look around Google using the search term "space suit replicas" turns up sources that will build them for a user. The prices are a bit "out of this world", however. A replica helmet at Spacetoys.com can run upwards of $3,500. A pressure suit like the ones the astronauts wore into space and to the Moon begins at around $1,500.00 and can cost upwards of $10,000.00! Actual suits are a little too heavy-duty (and costly) for casual costuming. So, what's a space fan to do? If buying a replica is outside of the budget, it's possible for the crafty to make their own jumpsuits. One thrifty fan described making a suit at Astronaut.com, creating his own Apollo suit. Another fan published a step-by-step Mercury spacesuit construction project for anyone to follow. Many costumers who want to recreate a space jumpsuit begin with a pattern for coveralls commonly found in most fabric stores. The material in some of the best replicas is a mix of cotton and polyester that can be washed and worn many times. After constructing the jumpsuit, it's a matter of finding suitable mission patches to decorate it properly. Those are available at such places as the U.S. Space and Rocket Center and most NASA gift shops. An Astronaut is Stuck in Space Without a Spacesuit: What Happens?